Riccardo graduated from the University of Milan, Italy. He worked at the University of Milan teaching undergraduate students and in General Practice, before he moved to the UK in 2007. He was selected for a three-year full time programme in Periodontology at the Eastman Dental Institute (London) and obtained his MClinDent in Periodontology (2010, with Distinction) and a Certificate in Periodontology by the European Federation of Periodontology (2010). He then worked as a Clinical Research Associate at UCL Eastman Dental Institute. His research focussed on the treatment of gum disease in patient with systemic conditions and diseases, dental implants and bone regeneration. He has published several scientific papers in both national and international journals. 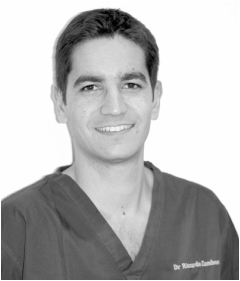 Riccardo has been teaching Periodontology and Implant Dentistry at the Eastman Dental Institute (University College of London). since 2011. He mentors postgraduate students preparing for their Masters degree and those on the Specialist Training programme in Periodontology. ​He is a member of the International Team for Implantology (ITI), British Society of Periodontology (BSP) and the European Federation of Periodontology (EFP).